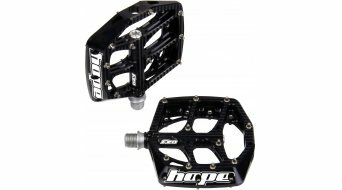 The pedals feature a fully CNC machined platform out of 2014 T6 Aluminium alloy with anodised finish. The axle is made of high strength Cr-Mo, heat treated and plated. The platform is slightly concave in shape and is supported by one Norglide bush and 3 cartridge bearings in a fully sealed chamber to ensure a long lasting and maintenance free running. The 20 replaceable pins per pedal will provide excellent traction and grip.